Nothing is more important in marketing than content. Content is everything, whether you are providing it via your website, email marketing or on your advertising banners. Everything you deliver to your audience in the form of written and visual content helps you keep them interested and engaged with your brand. It also helps you attract more customers, expand your audience and ultimately, grow your business. Sometimes you will also need to consider the possibility of amplifying your content through advertising. This article will highlight the importance of content marketing and pinpoint some of the best advertising networks. Content marketing covers a broad spectrum of strategies and data. Ultimately, its main focus is to create and distribute valuable information to the audience. According to a report published by the Content Marketing Institute on B2B marketing, 88% of businesses already use content marketing, and they use a diverse range of tactics. Is there any evidence that these strategies are effective? We know that 70% of the consumers say they are more likely to read about the products they use. They would also like to learn more about them through content rather than the traditional advertising methods. Even the purchase intent of those who are clicking on native advertising links is significantly higher than of those who are clicking on traditional banners. Content will also helps increase a website’s domain authority by helping the search engine optimization. The more relevant content you publish, the more material the search engines crawlers have and the better your website will rank. Many companies already choose paid amplification on social networks, and almost half of them pay for native advertising as well, according to Content Marketing Institute. In order to properly assess which one of these channels better suits your marketing goals, you need to know them, evaluate them and find out how they work and what you can expect from them. According to this report, “Search engine marketing (SEM) is the paid method that B2B marketers use most frequently” for content distribution. While social media grows in popularity with every new year, search engines are still an important part of the online market. Google Adwords allows you to exploit people’s need to find answers to their questions via online search, and deliver your content directly, by placing your ad on top of the search list. Why is Google Adwords relevant in this context? Most businesses are willing to pay for ads to drive more traffic to their websites, and almost everyone uses search engines to discover content or to find answers to their immediate questions. According to HubSpot, 75% of users don’t get past the first page of results in a google search. Therefore, you need to make it to the top in order to make sure you get to your audience. Paid search gets you there quicker than any other option, and while it’s not free, it may prove to be quite effective for your marketing strategy. 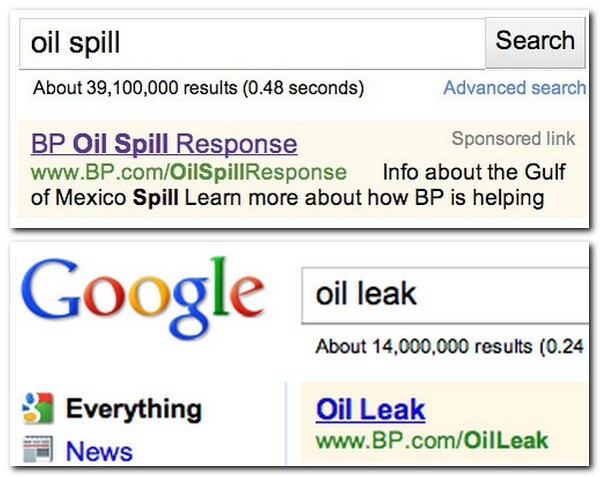 Take for example a search marketing campaign run by BP in 2010, when an oil spill challenged their reputation. In order to clean their name, they published an online response which had to get to the relevant population. How? Well, they decided to pay for search ads on a Google Adwords campaign. According to Search Engine Watch, they targeted specific keywords related to their problem such as “oil spill” and “oil leak.” Thus, they managed to get a click-through rate of 15% due to the high visibility in the search engine top results. Out of more than five million searches per month, their website received more than 750,000 visits. This is an interesting use of ad words because it does not overtly advertise a product but information about a company response to a news story about them. An extension of the premise of content marketing to ad words suggests advertising information related to an industry event or audience question. With Google Adwords, you can target keywords, based on popular searches related to your industry or a complementary industry. You can also target users by location, language or the device they use to connect to the Internet. The costs of the campaign depend mainly on your choice of keywords. The more popular the keywords are, the higher the Cost Per Click for using them. Adwords use an auction-based system where you get to specify exactly how much are you willing to pay for each click. One word of caution: over time, search engine users have become more savvy and often view ads with suspicion. When using ads its important to continue pursuing other tactics to insure direct and organic, as well as paid traffic to your site. Outbrain is a native advertising platform that allows you to promote your content on a huge list of popular websites such as CNN, Time or ESPN. By using this channel, you have instant access to millions of users from all over the world. This is a great chance to expand your audience, boost your brand awareness or drive in quality traffic to your own business website or blog. Unlike traditional banner ads, these native ads are not intrusive, and they are published on the targeted websites as recommendations for the users. See the following screenshot for a clearer understanding of how Outbrain ads look like on Time.com. Why is Outbrain relevant in this context? Native advertising performs 10 times better on mobile devices than traditional banner ads. Users say they pay 3 times more attention to native ads than other types of banners, a report said. These are numbers you cannot ignore. Here’s a great example of how Outbrain can help you grow your business. It comes from 8fit, a fitness app that offers personalized plans for workout and nutrition with step by step instructions. They invested in Outbrain ads with a series of articles related to their industry which led people to their online magazine and ultimately, to their app. Their goal was to convert visits into subscriptions and app downloads. What was the result? Over a period of four months, their fitness app was downloaded on several hundred thousand devices. Outbrain allows customers to select where ads will be delivered based on audience segmentation, location targeting, and device targeting. You can also blacklist the websites you don’t want your ads to appear on. The service also provides a Reach Estimator Tool that allows you to estimate your monthly potential reach. Thus, you can make smarter targeting decisions and ultimately, allocate a proper budget. How much does it cost? Outbrain, like Facebook, lets you allocate a daily budget, which is allocated on a per click basis. Thus, if you have a $50 daily budget, and set your cost per click amount at $1, your campaign will run for the day until you have 50 clicks. Again, keep in mind that consumers are very savvy and ad-sensitive. They may or may not click through to content if they suspect they are being manipulated. Content Marketing Principle to Apply: As with any content, understanding your audience and their questions or needs and answering them in a winsome way is the most important factor to keep in mind. If you are sponsoring content on Outbrain, consider looking at the most popular content for each of the sites you target, then providing something that aligns with what has resonated with the specific audience. If you aren’t sure what types of content perform best for a particular domain, take time to study the social shares of content at their site. BuzzSumo’s content analysis and content trends tool are a great way to speed up the process. How is BuySellAds relevant here? All content is not created equal. There may be instances when you would like to promote important and valuable reports on platforms such as BuySellAds in order to generate more downloads, views, and mentions. Long guides, eBooks or maybe an extensive report study are examples of high production value content that could be boosted with banner advertising. All websites that are part of the network are organized by categories and topics of interest, which allows the advertisers to make an easier selection of the websites their banners are to be published on. The platform also gives you access to stats related to the most recent audience of a website and gives you insights about the price of every banner ad placements on each website you choose to include on your campaign. The costs depend on which website you choose. Prices for banners pace are determined by each website in particular and can vary from $10 to a few hundreds of dollars for an ad placement. Tools such as this banner generator from Bannersnack help you to create your own professional banners. Content Marketing Principle: Verify that your audience is interested in the topics associated with the sites where you will advertise. Once you know there is interest, consider how much competition you have to be the best answer for questions in the topic area. Facebook is the most popular social media platform for content distribution, and one of the most popular advertising channels as well. According to Social Media Examiner, 84% of marketers use Facebook as a regular advertising platform in order to drive more traffic to their websites and promote their content. An average user spends 35 minutes connected to Facebook every day. Why not use this time to expand your audience and get them interested in your content? Why is Facebook relevant in this context? Facebook supports a wide range of ads, most of them suitable for content promotion. Several of them are well suited for content promotion. With boosted posts, you get to promote posts from your Facebook page and consequently, your Facebook content. You can also boost posts that promote your blog and website’s articles. Similar specs, to those available in Link Click Ads, apply also to boosted posts. You are allowed to promote posts with a headline, a link description, and an ad copy text. The only difference is that the ad copy text has no restrictions on the lengths of the text. These ads are designed especially for mobile and are supposed to run ten times faster on mobile than the regular web-based ads. Canvas ads are interactive and designed to completely capture the attention of your audience. You can share images, videos, allow people to swipe through carousels and engage with products or images. You can also include text blocks here, buttons for offsite links and headers with logo. On Facebook, you can target users by demographics (location, language, gender, occupation etc. ), interests and connections with specific activities, behavior and social circles. According to this Facebook ads guide, there are more than 1.59 billion monthly active users on Facebook. This means that the general audience is big enough for you to target your ads effectively based on the above stats. You can also decide to deliver ads only to your connections or create a delivery list, a custom audience based on Facebook user IDs, email addresses or phone numbers. Facebook Advertising, like many other similar networks, is a bidding platform. This means that you, as a marketer, should specify how much are willing to spend with a specific campaign. Costs differ on a CPC (cost per click), CPA (cost per action), Impressions, and CPL (cost per Like) basis. Instagram is owned by Facebook and therefore, all the advertising and targeting options are available on the same platform. Not a long time ago, Instagram also launched a new feature, Instagram Stories, followed by Ad Stories. Ad Stories allows you to publish your ads in full-screen format within the slides of other peoples’ stories. Thus, you can add another channel to your advertising strategy, one that may also take you to your relevant audience. Another great way to promote your content on Instagram is through an influencer marketing campaign. Unlike other types of advertisements, if you find the right influencers for your business, you get to deal directly with them and pay them for their contribution to your campaign. According to Digiday,”Brands can start with $250 per Instagram post for social stars with less than 50,000 followers, then add roughly $1,000 per 100,000 followers per post.” However, prices can go higher if you are targeting a well-known celebrity. Content Marketing Principle: When working with influencers, begin with an organic relational approach and remember to think about the WIIFT principle: What’s In It For Them. Before asking for help, offer influencers your support as an active member of their audience, sharing, liking and commenting on their content over time. Ideally, you should begin this process long before you ask people for help in amplifying your content. “Buyers prefer LinkedIn as the top social network for sharing business-related content, with 84% sharing business content on LinkedIn” a report published on Curata says. This means that although Facebook and Instagram are in some ways more popular among marketers than other social networks, when it comes to B2B marketing, LinkedIn is a network you should consider as well. LinkedIn serves self-serviced ads in the form of sponsored content, sponsored InMail and text ads. Why is LinkedIn relevant in this context? Sponsored content (sponsored updates allow you to post sponsored content and updates in other peoples’ news feeds. Sponsored InMail ads allow you to send your content directly into your targeted audiences’ inboxes linked to their LinkedIn accounts. Text ads allows you to place ads on (and across) the LinkedIn website. These ads are similar (and look similar) with the Adsense ads published with Google Adsense. The really great thing about LinkedIn is that it is a business-oriented social network. This means that besides the traditional targeting options available on other channels, you get to target your ads based on other relevant data such as: job title, skills, company size, industry, LinkedIn groups etc. All these extra targeting options are relevant especially in B2B marketing, where companies need to reach out to other companies or people that are relevant and can make decisions for those companies. What about the costs? LinkedIn offers two types of pricing models you can choose from, the traditional duo CPC (cost per click) and CPM (cost per 1000 impressions). Content Marketing Principle: Tailor the content you promote on LinkedIn to match audience preferences with research into what types of things get the most engagement on the network. Keep in mind that publishing directly on Linkedin via the publisher platform can also be an effective way to reach people who look to LinkedIn for authoritative content about their topics. 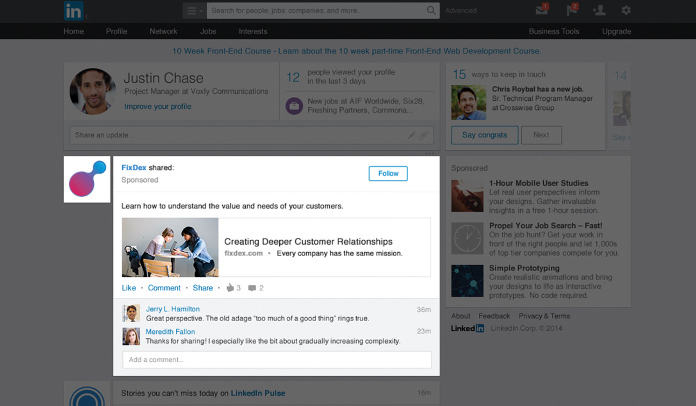 Add an influencer component by quoting people whose long-from posts on LinkedIn are heavily shared. As a marketer, I am sure you already know how important is content in your marketing strategy. However, sometimes it may not be enough to research, write, and publish your content. You might need some extra strategies to help you get to your audience. Paid advertising should be a part of your strategy. We’ve learned together why ads are effective for content amplification and where you can sign up in order to start an advertising campaign. Mainly, it will help you reach your goals professionally and effectively. Which one of these advertising networks did you try already and what were your results? Do you know other channels suitable for a content marketing strategy? Name them in the comments section. The tip about letting your posts run for a period of time before boosting them is great. I never considered that. Thanks for sharing this. Tons of great information. That is a lot of cool info. Thanks for the share Robert. I tried Google Ad, i’m more into SEO. But I’m thinking to try again Google Ad. I find their platform not so easy to manipulate. How much budget should we invest in content ad ? Thanks so much! Really glad you found it helpful.